A longstanding presence in the Queens art community, Socrates Sculpture Park serves not only as a working studio and exhibition space, but as an exciting space for neighborhood events and engagement. Subject to poor drainage and overuse, Socrates needed a revamped landscape to showcase its rotating collection without losing its unique, grassroots character. SCAPE approached the project with the goal of framing a clear central gathering and installation space with ecologically, horticulturally, and programmatically diverse edges to showcase art. 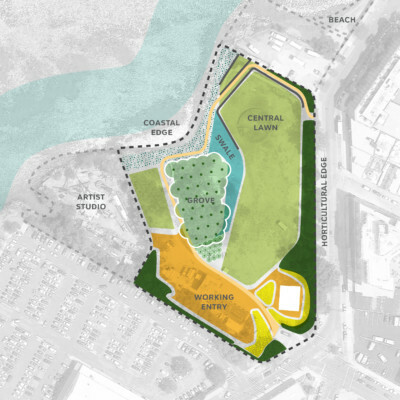 The initial design process identified opportunities to leverage existing topography, lifting the central lawn out of the floodplain and incorporating the river’s ecology into a central, sunken swale. This design move will address the flooding that currently plagues the site. 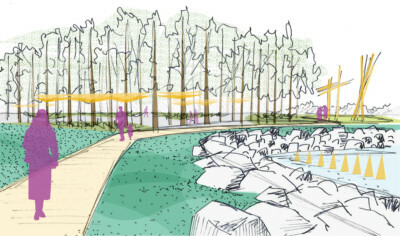 SCAPE also sought to reinvent the way people experience the park by proposing a dynamic eco-path to unify the park’s proposed programs. The surrounding neighborhood is changing rapidly, which means Socrates will see higher volumes of visitors to this critical public space resource.